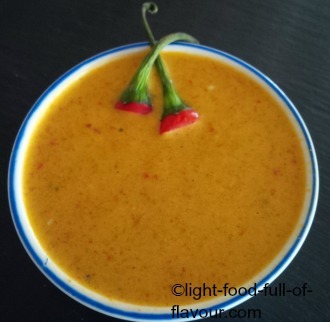 I want to give you an incredibly versatile and utterly delicious Thai-style curry sauce. You can add vegetables for a vegetarian curry, or add fish and/or prawns for a seafood curry, or chicken to make a chicken curry. This is a fantastic sauce to have in the freezer as you can whip up a gorgeous curry in no time. 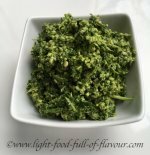 You make your own paste – it’s not difficult – but once that is done this curry sauce comes together very quickly. It might look like a lot of ingredients but I have deliberately chosen quite common ingredients, leaving out more specialized ones. As Asian-style food is so popular in so many countries these days, you should be able to find it in most supermarkets. The only fat I am using in this Thai-style curry sauce is coconut fat – coconut oil for the paste and coconut milk for the sauce. You can replace the coconut oil in the paste with vegetable oil if you can’t get hold of it. Coconut oil is so common in Britain today that it’s sold in well-stocked supermarkets as well as health food shops. • To make a vegetarian curry you could oven-roast diced vegetables - such as squash, carrots and sweet potatoes – and add them to the curry sauce once they are nearly cooked. At the same time you could add vegetables such as sliced sugar snaps, broccoli florets, sliced peppers (bell peppers) and halved cherry tomatoes and cook for a further 3-4 minutes. • To make a fish/prawn curry, add bite-size pieces of firm white fish and/or raw prawns to the sauce together with some sliced sugar snaps and peppers (bell peppers) and thinly sliced carrot sticks. Bring the curry back to a boil, lower the heat and simmer for about 3-4 minutes until the fish/prawns are cooked through. The vegetables should still be crunchy. • To make a chicken curry, add thinly sliced, skin-less chicken breasts or chicken thighs to the curry sauce. Once the sauce comes back to a boil, lower the heat, stir to separate the chicken slices and allow simmer for about 7 minutes. Add some sliced sugar snaps and peppers (bell peppers), stir, bring back to a simmer and cook for a further 3 minutes. You can top either of these curries with some fresh coriander (cilantro) leaves, Thai basil and chopped spring onion (scallion). If you are watching your weight or want to lose weight, avoid eating the curry together with white rice or things like naan bread. Quinoa is a much better choice – both for your weight and your health. Tip: if you can’t find unwaxed lemons and limes, make sure you scrub them really well with a clean scrubbing brush under running water. And when grating the zest, don’t be too forceful. You only want the very outer layer of the fruit, not the bitter pith, the inner white part. 1. Start by making the paste. Place all the ingredients, apart from the turmeric, in a blender/food processor and blitz to a smooth paste. 2. Place a wok or large frying pan with high sides over a medium heat. Add all of the paste and the ground turmeric to the pan. Stir and fry for about 2 minutes. Add the coconut milk, water and Thai fish sauce to the pan, stir, bring to a boil, then lower the heat and allow the curry sauce to simmer gently for about 10 minutes. The Thai-style curry sauce is now ready. Once you have added and cooked whatever ingredients you have chosen for a curry – finish it off by adding the lime juice and check the seasoning. Add a bit more fish sauce if you think it needs to be a bit more salty.